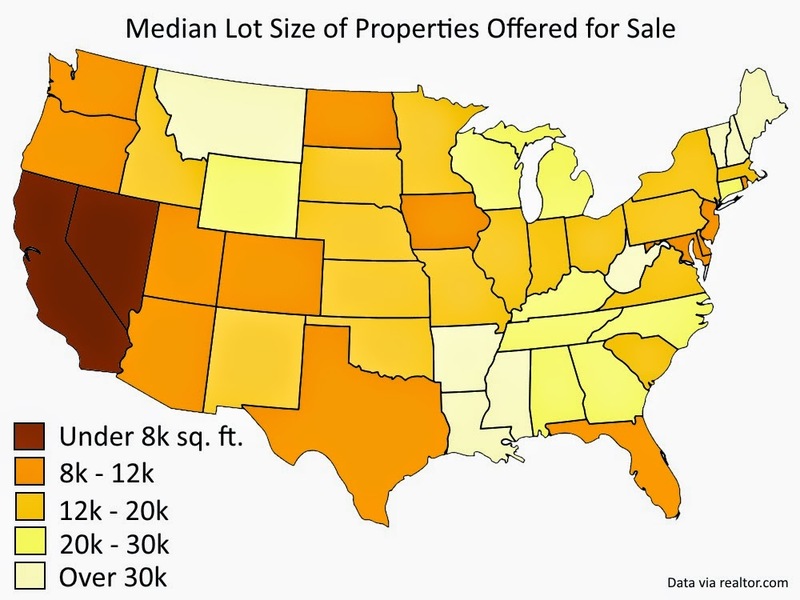 In a prior post, I examined minimum lot sizes as a general concept with reference to a few examples. 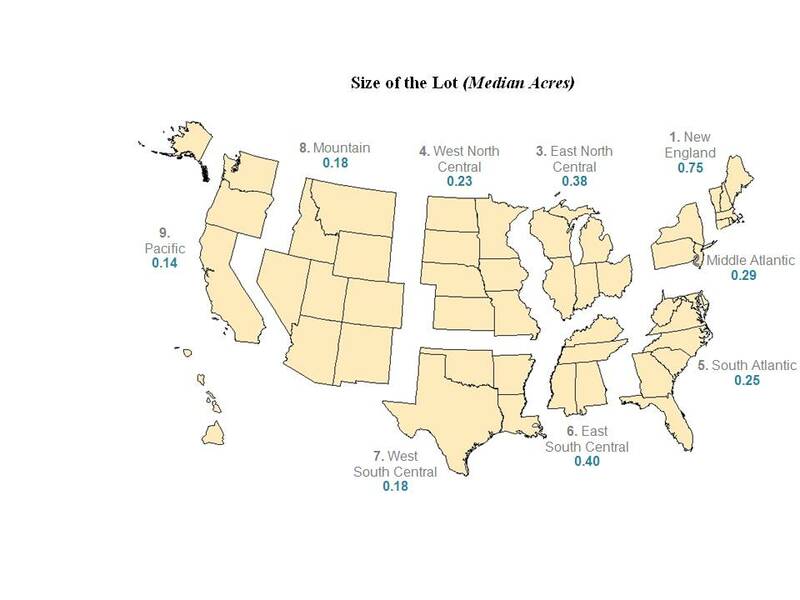 Another way of approaching the subject is to examine regional and national patterns and trends on lot sizes. Although the subject doesn't get a great deal of attention, and Census information is not as detailed as one might like, it is possible to cobble together some statistics. 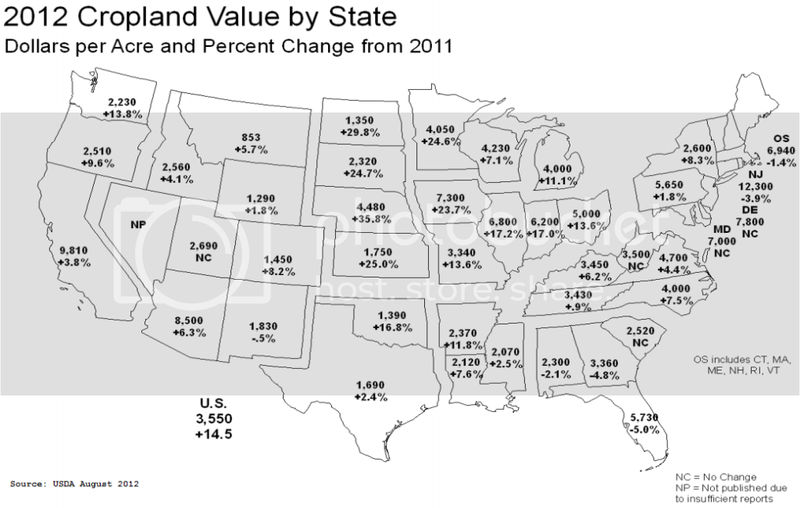 The outlier value for New England in the median lot size map seems to fit the well-known historical account of agriculture in that region, where after the arrival of railroads carrying midwestern grain in the later 19th century, farms were rendered unprofitable and were abandoned en masse, leaving only stone walls -- 250,000 miles worth -- through new-growth forests as a sign of their former presence. During the height of this abandonment in the 1890s, some New England counties, like Tolland County in Connecticut or Rutland County in Vermont, actually declined in population. 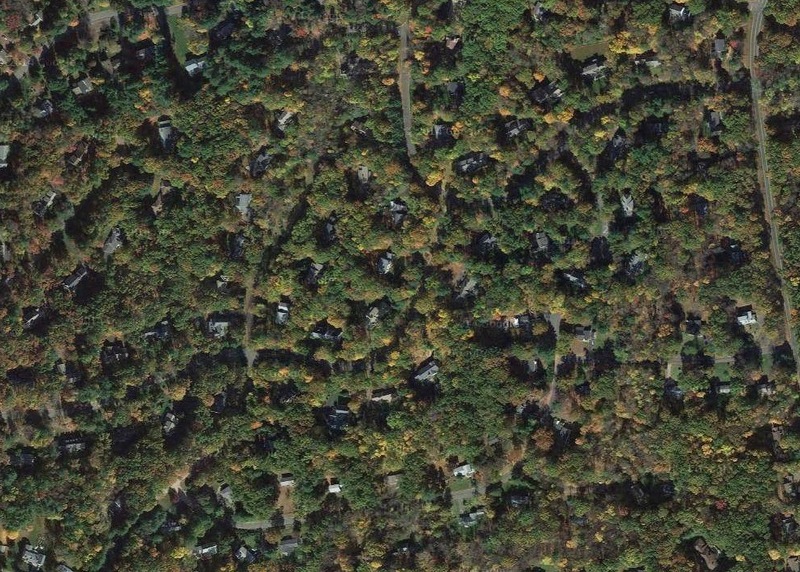 Post-1950 tract homes in New England, built in forested, rocky terrain, prefer to sit Walden-like in their own little forest clearings, as though each homeowner were an 18th century pioneer carving out a homestead in the wilderness. Much of New England, as William Fischel also notes in Zoning Rules!, with a wet and cool climate, is heavily well-watered, with the result that homes need not be clustered closely together. Outer suburbs of Hartford, CT. 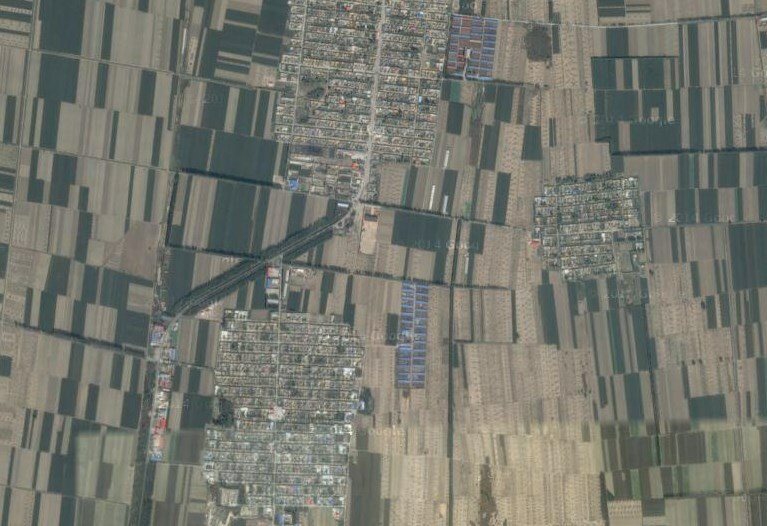 The Villages: homes built for former residents of Hartford, CT.
Farm towns in Heibei province, east of Tangshan, China. A few exceptionally large cities of the ancient world imported grain by ship, but for the most part cities were dependent on their agricultural hinterlands. 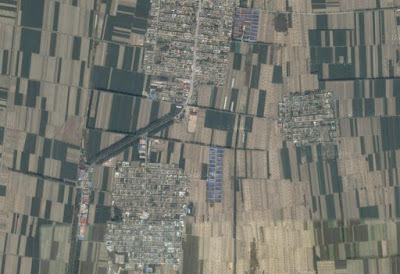 Until the early industrial era, the high value of this land for crops probably did not impose significant constraints on city expansion (as opposed to the limits of sanitation, transportation, the need for a defensible perimeter, etc), but in an age of rapid population growth and urbanization, the cost of land acquisition gained greater significance. Where land has little value for agriculture, we should not be surprised to see greenfield development taking lower-density forms. The Villages is interesting. It's clearly targeted at retirees, who typically don't need large houses (all their children having since grown up and left home of course). I wonder how these retired folks feel about the increased density, and if they feel that it being in a regular (non-retiree) area and with an extra story or two on the house for space, if it would have been suitable for raising children. The diagonal slant of many of the houses is peculiar too - a concession to having a driveway I guess. And of course the endless dead-end streets with few to no walk paths through to other streets make it virtually useless for walking, even more so when you're 65 and over. Thanks for posting more articles, btw! 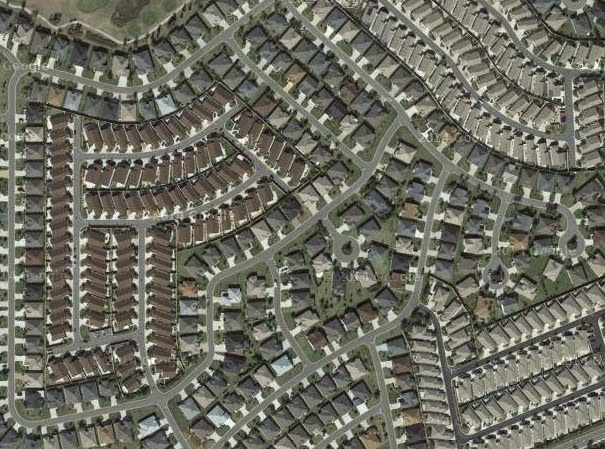 Yes, the diagonal orientation reminded me of the arrangement of manufactured home lots. Many of the houses in The Villages have similar dimensions. And I agree it is utterly useless for walking -- I think golf carts are an important mode of internal transport (partly for the obvious reasons, partly due to weather/topography, and partly due to the self-contained nature of the settlement). Glad to be writing a bit more, although I had something of a backlog to clear out. Have not given up on the blog by any means, but life intrudes!